Could I be more cliché here, giving you this recipe for a Superfood Salad three days into the New Year? I know you’re being bombarded with gym advertisements and weight-loss messages everywhere you turn. 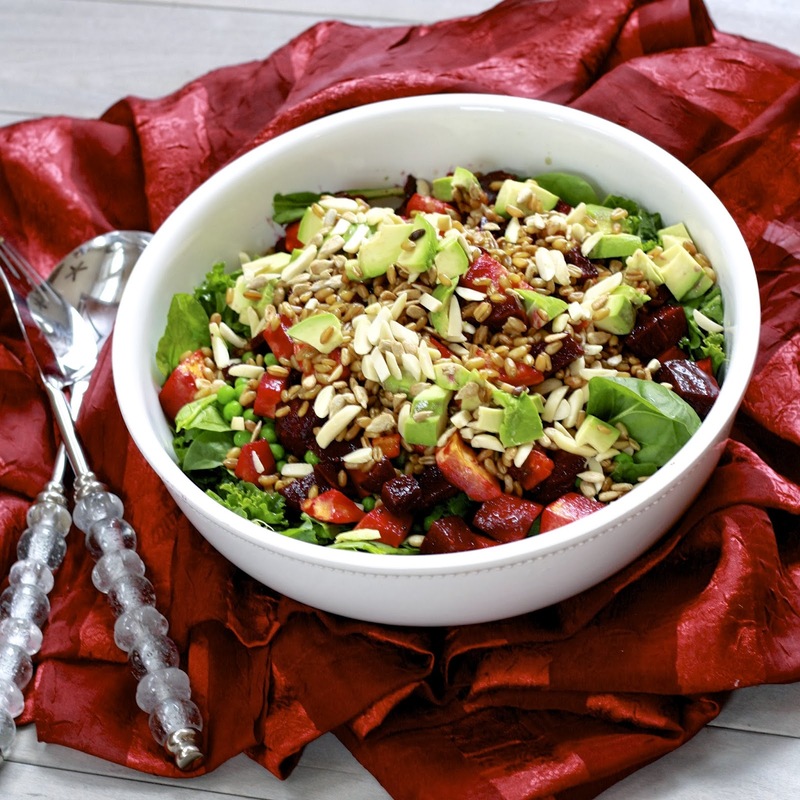 I hold firmly to my beliefs about balanced eating and try to practice what I preach, so we’re still eating desserts and carbs and cheese around here, but there are just as many vegetables and healthy fats, which is where this salad comes into play. In fact, my brother-in-law and sister-in-law passed this recipe along a few months ago, knowing it sounded like something to come from The Sweets Life kitchen. They nailed it—we ate this up, literally and figuratively! I’m much worse about planning meals on the weekends. We abide by a meal plan all week long, but by the time Saturday and Sunday roll around I’m either burnt out from planning or our plans are too crazy to have time to cook proper meals. We do a lot more snacking on the weekends and our vegetable intake is often embarrassingly light. Amazingly, however, I decided to make this one Saturday for lunch between a morning run & chores and an afternoon full of errands. I’d premade the freekeh, made the dressing, and roasted my vegetables the night before, leaving little more to do than toss the various components together. Whatever day you’re eating it, I highly recommend saving yourself some time and going this route as well. It’s hard to say eating healthfully is too tedious when you do a little bit of planning! 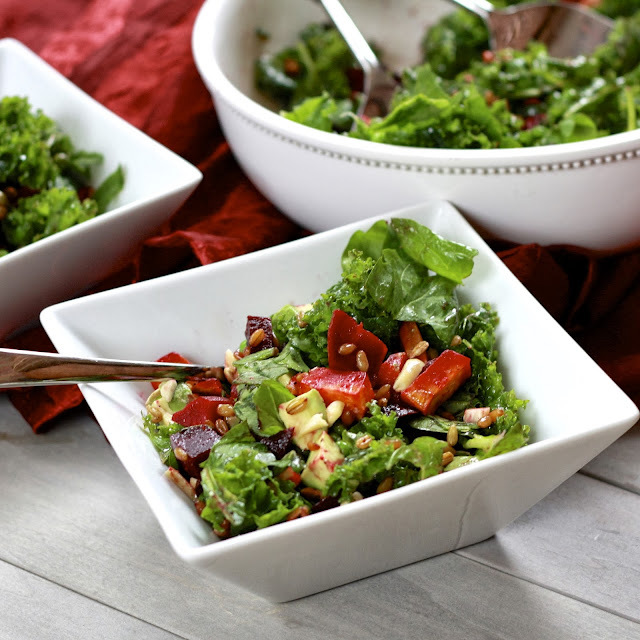 And I don’t know if its simply the title or the fact that the salad is so chock full of good things, but you really will finish your meal feeling a bit healthier and more balanced…something we’re all looking for right now! 1. Toss the sweet potatoes and beets with olive oil and place on foil-lined baking sheets. Season with salt and pepper and roast at 400F for 30-40 minutes, flipping halfway through, cooking until vegetables are soft and lightly browned. 3. Add spinach and kale to a large bowl. Massage vinaigrette onto greens and allow to rest for at least 15 minutes (note-you will not need all of the dressing. Save and reserve for another use). 4. 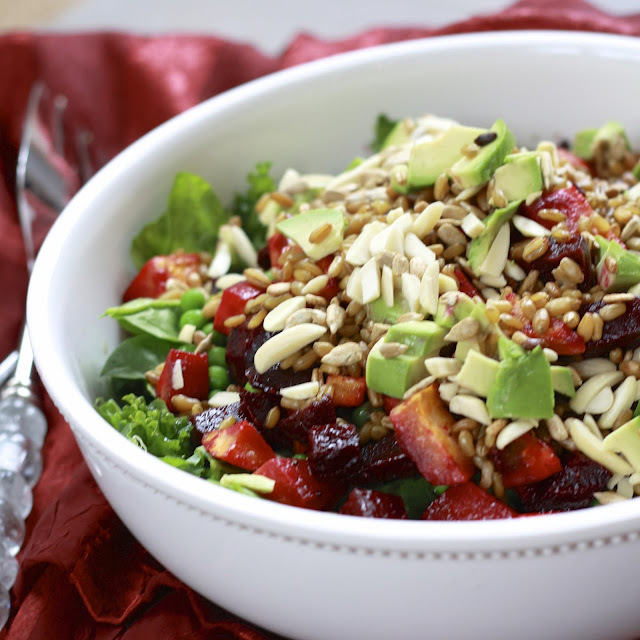 Add roasted vegetables, grains, and peas to prepared greens, tossing to combine. Sprinkle with almonds, sunflower seeds, and avocado, gently tossing. Season with freshly ground pepper and serve immediately.